Here in the Charlotte area, many communities offer wooded or partially-wooded back yards with mature trees and even lake frontage. Natural landscapes lend themselves beautifully to stone outdoor living design elements. Whether you live near Uptown, or in one of our many Charlotte suburbs, the beauty of stone outdoor living design is a popular request. Stone outdoor living elements offer visual interest by way of color and texture. Stone can create inviting focal points with outdoor fireplaces and fire pits or take on a dramatic aesthetic with a complete patio design. 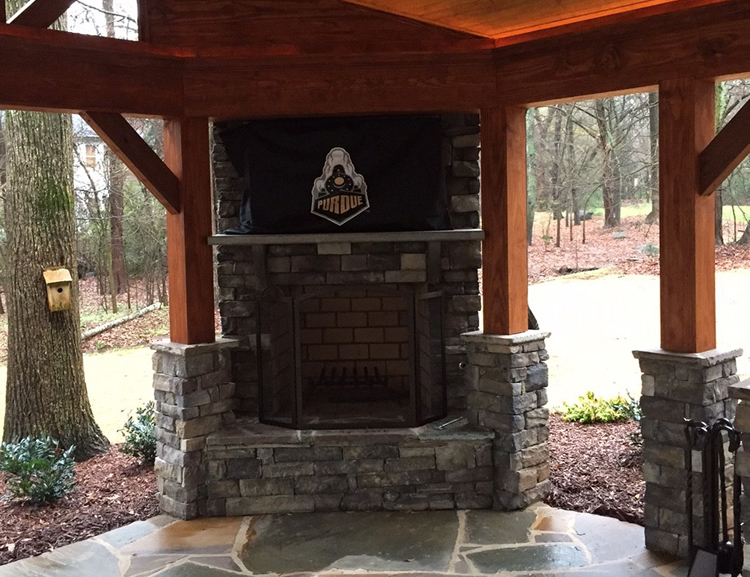 What are some of the ways Archadeck of Charlotte can add stone to your new outdoor living design? Take a look! 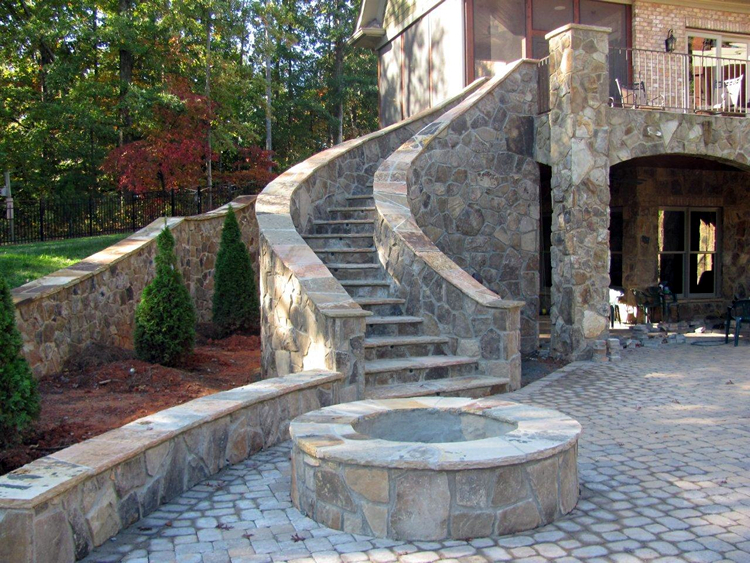 This gorgeous Charlotte stone patio comes complete with not only a custom fire pit, but a curved stone stair, beautiful seating wall, and retaining wall, all tying in with stone columns, archways, and siding on the home. This patio is an example of high-impact stone outdoor living design, where the entire space is constructed using stone. The natural colors and textures lend themselves beautifully to the wooded lot and creates a whole lavish stone aesthetic. 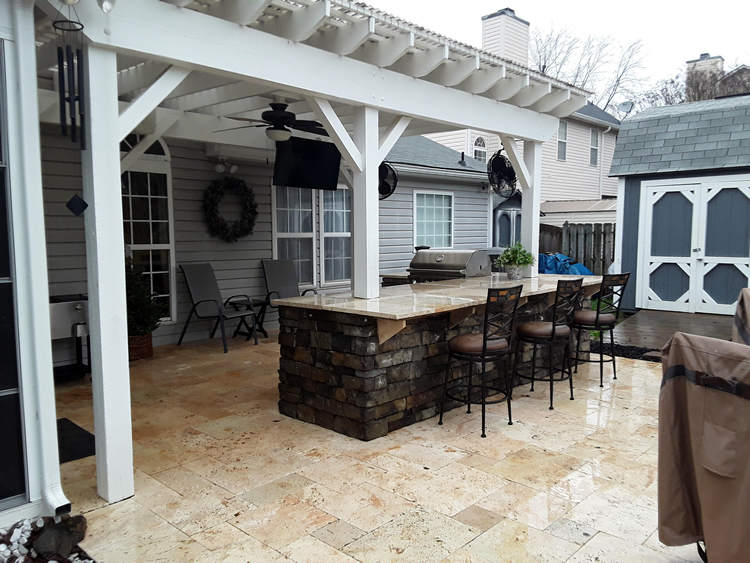 This lovely, partially-covered travertine patio is perfect for entertaining, complete with outdoor bar. Travertine is one of our most beloved patio materials. It offers a clean design aesthetic, and the benefits of natural weather resistance. The saturated colors of the stacked stone bar façade are the perfect complement to the smooth travertine patio and clean design of the white pergola. Another great way to add stone to your outdoor living design is with your outdoor bar top, or even the work surface of your outdoor kitchen! This gorgeous, partially-wooded lot sets the perfect scene for this deluxe outdoor living space. The flagstone patio anchors the entire space, offering a rustic air by way of irregular shapes and a plethora of earthen colors. 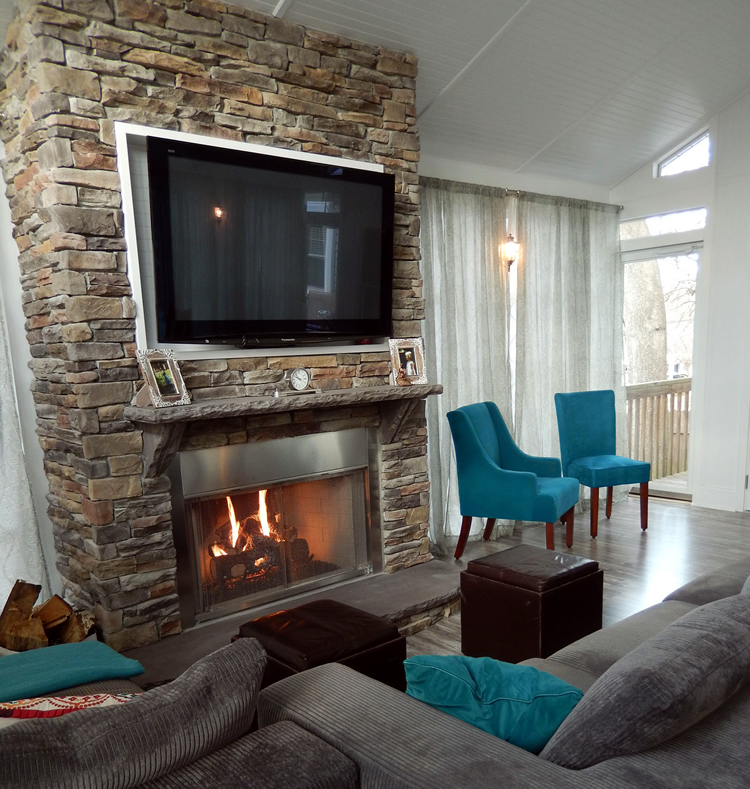 What better way to add stone than with a beautiful fireplace surround? The stacked stone columns of the cedar pergola offer an added element of the entire ruggedly cozy aesthetic. Add stone to your deck! What? Even if you think your outdoor living plan won’t be ideal for stone elements, this photo is a great representation of how we can add a lot of character with small stone elements. 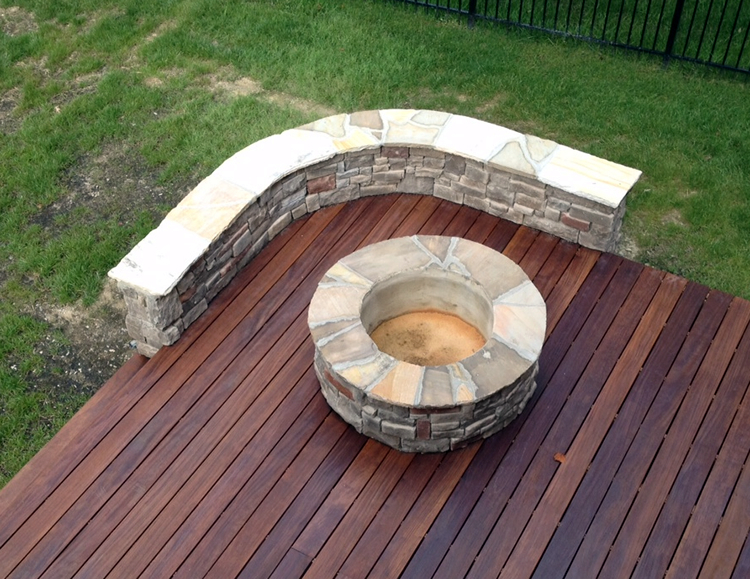 This Ipe wood deck would have been beautiful and useful on its own, but by adding a custom stone fire pit and accompanying stone seating wall, Archadeck of Charlotte transformed this Charlotte deck into so much more. This deck now not only has a cozy conversation area, but also loads of custom character that stone offers. If you thought you couldn’t add stone to your deck, think again! Adding stone can give your outdoor living space beauty and function. 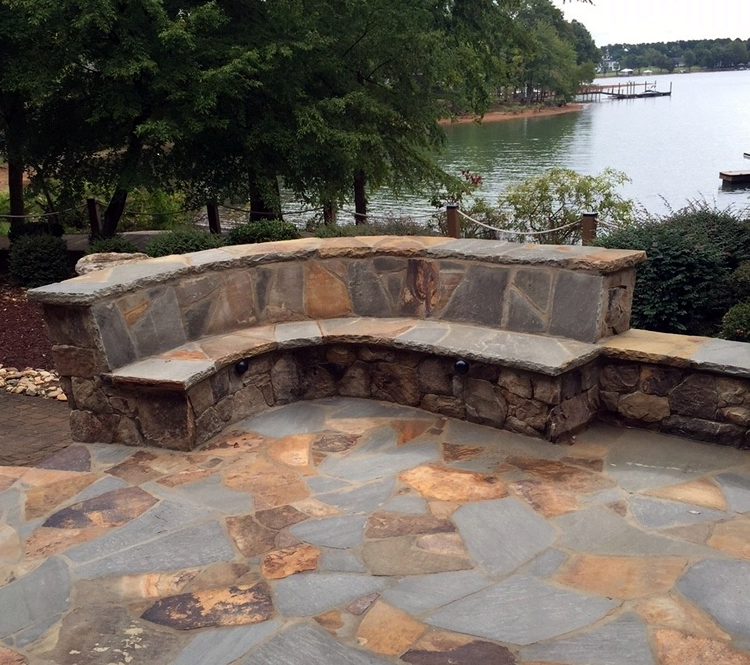 This seating wall on Lake Norman offers a fantastic area for scenic waterfront conversation. Archadeck of Charlotte is ready to help you achieve your ideal in outdoor living, no matter your needs. How do you see the addition of stone elements in your new space? Are you ready to plan your new outdoor living space with stone elements? Whether you are looking for a deluxe outdoor living design, or a deck with stone elements, we can help! Give us a call for a free design consultation at (704) 944-1350 or email us and a Design Consultant will contact you promptly.